Are you ready … right now, to breakthrough to success and live the life of your dreams? Have you been applying the law of attraction, yet still not seeing the results you want? Have you visualised, used affirmations, created vision boards and everything else you can think of, to little or no avail? Well, you are not alone and you are NOT weak-willed, lazy or a failure. The thing that’s stopping you from attracting and having everything you want in life is that your Conscious mind and your Subconscious mind are pulling you in different directions. Your conscious mind wants to attract unlimited abundance, wonderful relationships, vibrant good health and vitality, an amazing career, a fabulous home and so on. But your subconscious mind is running old limiting beliefs, feelings of unworthiness or not being good enough and old habits of behaviour that may have served you well once upon a time, but now just get in the way. it is possible to ALIGN your Conscious and Subconscious mind, and when they are both in 'sync', the magic and miracles of life open up to you. Money mysteriously and unexpectedly flows into your life. Your relationships take on a completely new experience. Your heart opens up. Communication is open and honest. Emotional anxieties that have entirely consumed you quickly and easily fade away and you enjoy more peace and joy. Business opportunities that eluded you in the past make themselves available to you - in the most perfect and ideal way. This is the BREAKTHROUGH that allows you to transform and take control of your life. Isn’t it time you achieved Your Personal Breakthrough? And you can do it in as little as 7 days. "Superb! I have taken a number of different personal growth and transformational seminars and workshops, and I was in total awe and astonishment at how incredibly powerful the program was. There are no other processes that can catalyze profound shifts in such a short and effortless manner. Don’t miss this program if you want to go to the next level of your life." This pack retails for $295! You can get it for a fraction of that cost. Our sales are processed through Paypal so you can use your credit card or Paypal account and have confidence that your payment is totally secure. Right now, as you read these words, your ideal future is within your reach. Your Personal Breakthrough is an interactive practical program that teaches you how to break through the barriers that have held you back, and that will move you powerfully towards the success you deserve. It helps you align the enormous resources of your subconscious mind with your conscious desires, so that you will be able to actualize your full potential and create the life of your dreams. Your Personal Breakthrough provides you with the unique opportunity to discover what you really want and how to achieve it in all areas of your life, including finances, career, relationships and health. 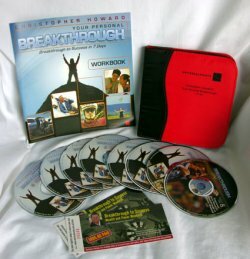 Chris Howard has taken the best information, techniques and exercises from his three day Breakthrough to Success seminar that he presents around the world and consolidated them here in this superb 7 CD and DVD set. Listen as Chris personally takes you through this step-by-step practical system consolidates more than a decade of research into the most advanced neurological, linguistic and repatterning tools available for accelerating profound human change. Chris’s teachings have been deliberately engineered into a simple and effective format that is easy and fun to implement. Chris will guide you through this proven process that will empower you to create measurable and long-lasting results that will positively change your experience of life. Begin a journey that will unlock your own inner wisdom and strength. "Christopher Howard’s programs are incredibly powerful. Within 9 months, I cleared six figures. Today I am facilitating my own workshops and enjoying financial freedom. I am living proof that Chris’s technologies are highly effective tools in today’s business world." Become unstoppable as you break through to long-term success. "Twelve months ago we owned a good business and had 10 investment properties, today we have a GREAT business and own 70 investment properties, more importantly, the depth of our love and connections we share and the richness of our life is beyond our wildest dreams… I attribute all of it to Chris Howard." But.... we promised you would only pay a fraction of that. and we'll ship it to youfor only $15 no matter where you live ...but hurry, we don’t know how long we can keep it at this price. Learn, keep and reuse these tools for life with this amazing CD & DVD pack. "This is the most powerful, life-changing information available. Last year I completed four of Chris Howard’s Programs. I’ve since increased my net wealth by more than $2 million, $600,000 of which I made in a single day using strategies I learned from Chris Howard. These programs guarantee succcess!" At our Special Price of only $47.97 (plus $15 shipping) ...numbers will sell out fast. 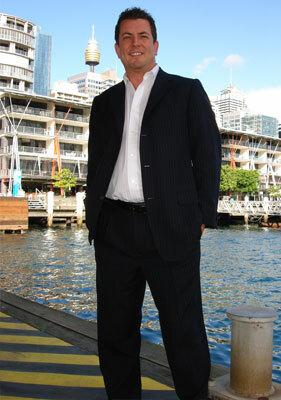 Christopher Howard is one of the world’s leading authorities on the psychology of wealth and accelerated personal achievement. Described as “the Richard Branson of personal and professional development”, Chris is an electrifying speaker who has captivated audiences in the United States and worldwide. Chris is also an international best selling author of his book Turning Passions Into Profits and of 9 best selling audio programs. Chris has conducted vast amounts of research into the lives and success strategies of the world's greatest business, philanthropic and spiritual leaders. As a result, he has developed a system to replicate the success strategies of the world's most legendary leaders and billionaires. 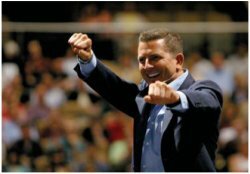 "The results you will receive from Chris Howard's seminars are priceless!" - Rev.Dr Michael Beckwith - Founder and Spiritual Director Agape International Spiritual Center / Teacher featured in "The Secret". "Chris Howard is an extraordinary man. I am privileged to be working with him closely on a number of spectacular projects. You will definitely catapult yourself into the future of your dreams by attending Christopher Howard Trainings." - Mark Victor Hansen - International Speaker / Best Selling Author / "Chicken Soup for the Soul" Series. "Chris Howard's highly effective tools and seminars will change your life forever." 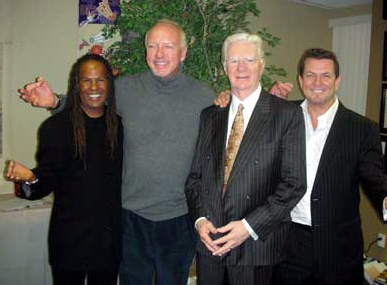 - Bob Proctor - Author / International Speaker / Teacher featured in "The Secret". On this amazing 7 CD set Christopher Howard takes you through a journey of self discovery where you will break through the barriers of your own limiting decisions and beliefs to succeed and achieve everything in your wildest dreams for both your business and your personal life. Normally this CD set is priced at $295, but we are making them available to you for a fraction of that cost , only $47.97 (plus $15 postage), for a limited time only. Our Special Price is $47.97! plus only $15 shipping anywhere in the world! ...but hurry, only limited numbers available at this price. Plus - we're so sure you'll be ABSOLUTELY STUNNED by the content of this CD and DVD set that we're offering an unconditional 30-day MONEY BACK GUARANTEE! Feel free to watch, use, enjoy and evaluate this product for a FULL 30 DAYS. If after that time you are not entirely 100% satisfied, simply return it to us for a full and prompt refund. There's no risk to you! Don't delay - BUY NOW! !